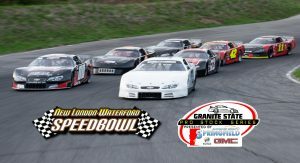 WALPOLE N.H. – The Granite State Pro Stock Series presented by Springfield Buick GMC will be rolling into Connecticut’s New London-Waterford Speedbowl Saturday, May 26th with a unique Triple 35 Format with Time Trials. Two Maine drivers lead the way, Jacob Dore of Sanford and Joey Doiron of Berwick look to continue their success far from home. “I like Waterford, we’ll see if we can go for two in a row, I’ve never done that before.” Dore said. “We never really got to show our strength in Claremont but, Waterford will be a track where we will be really good at.” Doiron said. The event will start with single car time trials. If over 24 cars attempt to qualify, 18 will be locked in, and we will have a consolation race. That will be TBD as current pre-entered projects have the car count at 24 from throughout New England. Once the field is set, we will go heads up for the first 35 lap segment. The second segment will invert all lead lap cars and be scored as its own event. The third segment will invert all lead lap cars from the previous, and will be scored as its own event as well. The car with the lowest points will win overall. Finishing position in each segment added together is your points total. In case of a tie, the finishing position in the final segment will be the tie breaker. As the season enters its second event, names like Barry Gray, Scott MacMichael, Nick Lascoula, and defending champ Mike O’Sullivan will be grinding for championship points. We will have some welcome competitors from other tracks and series joining us as well. Brad Babb from Windham, M.E. will be driving the BRF #42 along with George Bessette of Danbury, C.T and Kevin Folan of Arrleboro, M.A. Pit gates open at 11:00am, grandstands open at 1:30pm, and time trials will begin at 5:00pm. For more information on the Granite State Pro Stock Series, including the latest updates, fans are encouraged to visit our Facebook page or follow the series on Twitter, @GSProStocks.